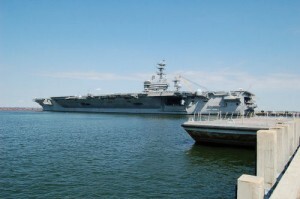 The Naval Air Station Oceana is centrally located in the coastal town of Virginia Beach, Virginia. Its mission is to support both the Atlantic and Pacific Fleets of Fighter Aircraft as well as other Joint and Inter-Agency Operations. Just last year, the base boasted over 250,000 takeoffs and landings. Naval Air Station Oceana has its roots in the 1940′s purchase of swampy Tidewater land along the Atlantic coast. In 1943, the base was officially commissioned, though on a small scale. With the advent of World War II, it gradually expanded. Due to its isolated location, it became the ideal installation for servicing specialty Naval air traffic. Oceana has continuously grown and now spans almost 6,000 acres of land with total building values estimated at $825 million. With over six miles of runways and employing over 16,000 military and civilian personnel, the base has attained status as a Master Jet Base. Though surrounding Virginia Beach has also grown to become the largest, most populous city in the state, Naval Air Station Oceana has maintained standing as the city’s largest employer. Beyond its large residential population, Virginia Beach is also a top-rated tourist destination. Its primary draw can be reasoned simply from its name: pristine, sandy beaches. Virginia Beach is even listed in the Guinness Book of Records as having the longest pleasure beach in the world. Located on the easternmost part of the Hampton Roads Region, the city borders the Atlantic Ocean. As such, Virginia Beach is an outdoor enthusiast’s paradise. Nearly 200 holes of golf provide challenging play experienced by some of the most renowned golfers in history. Surfers can enjoy taking part in the annual East Coast Surfing Championships. Fishing excursions take place year-round in the region’s consistently mild weather. Kayaking, sailing, boating, jet skiing, parasailing, and sunbathing are only a few examples of the outdoor watersports available. More structured water activities include dolphin tours, guided boat cruises, and oceanfront Yoga. Children can enjoy the splendor of the Virginia Aquarium and Marine Science Center or the traditional fun of sandcastle sculpture. Beyond the beach, this coastal town also offers a number of cultural and historical attractions. From visiting the oldest government-constructed lighthouse at Cape Henry, to learning about John Smith’s first steps along Virginia Beach’s shores, historical sites are sure to peak the interest of children and adults alike. Virginia Beach is also known for its famous oceanfront boardwalk, where you can casually stroll or bike amongst three miles of restaurants, hotels, and museums. Stop by the Old Coast Guard Station to explore the history of noted life-savers and mysterious shipwrecks. Or, take in the gorgeous sculpture interspersed along the boardwalk. Virginia Beachmagnificently blends the best of both worlds. By day, spend time working hard at the office or on-base, and by night, enjoy a miraculous mini-vacation in your new hometown. With market prices at an all time low, now is the perfect time to purchase your Virginia Beach home in one of the best-rated cities for family living. 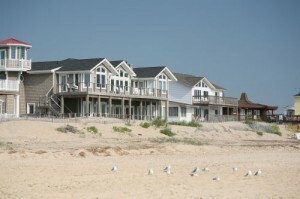 Median prices for homes for sale in Virginia Beach are $181,000 to $329,000 depending on the particular neighborhood. You can expect to find the many of the priciest Virginia Beach homes in the resort area. These properties are prime ocean front real estate, often located very close to the boardwalk and the most prestigious beach locations. They are perfect for anyone looking to be right in the middle of Virginia Beach’s active entertainment, fine dining, and history. For more affordable or less crowded waterfront properties, the Sandbridge area may suit your needs. Though Virginia Beach New Construction Homes featuring rooms in the double digits well exceed $1M, and upwards of $2M, condominium and modular homes start in the upper $200k’s. Further inland, the Lynnhaven area provides some of the more affordable options. Though the areas are spattered with luxurious million dollar mansions, single-family Virginia Beach Homes are available starting in the low $100k’s for two bedroom, two bath properties. The urban neighborhood of Davis Corner/Fair Meadows offers properties with the lowest median value, $181,000. This neighborhood consists mostly of smaller single-family homes and townhomes. It offers the unique charm of rowhouses, unavailable in many other cities. Virginia Beach offers an abundance of home styles, prices, and locations to match your personal needs. Let the team at Stone Realty Services help you find your perfect match. 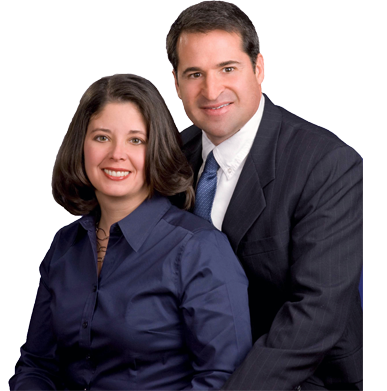 By relying on their seasoned knowledge of Naval Air Station Oceana realty and homes for sale in Virginia Beach, you can rest assured that you’ll be getting the best value for your money. Home prices are at an all-time low, but the Virginia Beach market is resiliently popular. As the market rebounds, be sure to start your search today, so that your dream home doesn’t slip away. The Stone Teams are ready to get started on finding you that once-in-a-lifetime dream home, so that the Virginia Beach sand between your toes can become a reality. Get started now by clicking “home searches” at the top of this page, or give us a call at (757)565-1043.